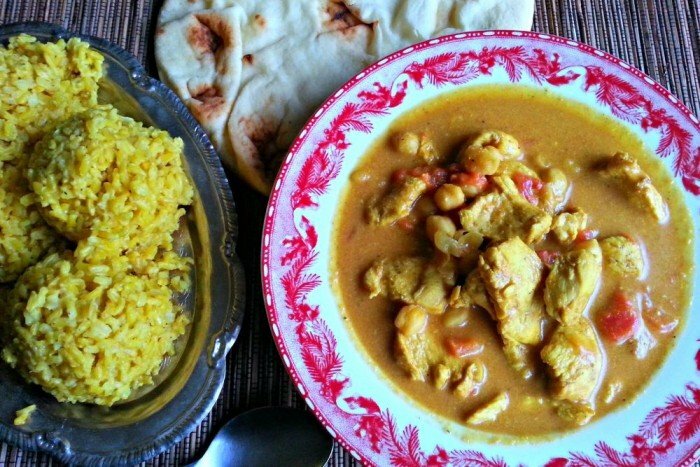 It is no secret that we seriously love Indian cuisine, and this Easy Chicken Tikka Masala Recipe is a favorite in our house. Since we have played with this recipe a lot over the last few years, we finally found what we feel is the best creamy sauce. Most chicken tikka recipes don’t include garbanzo beans, but we love the addition and it works well to stretch our budget a bit farther. 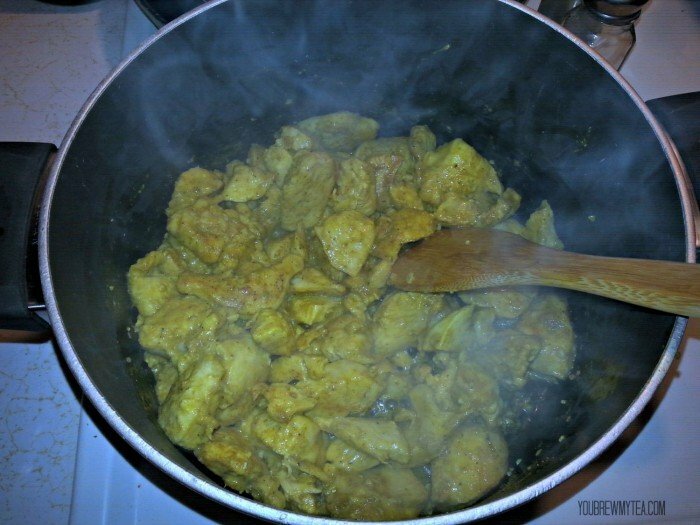 Chicken Tikka Masala is a popular dish in Indian cuisine. One of the best things about it, is that it can be versatile. 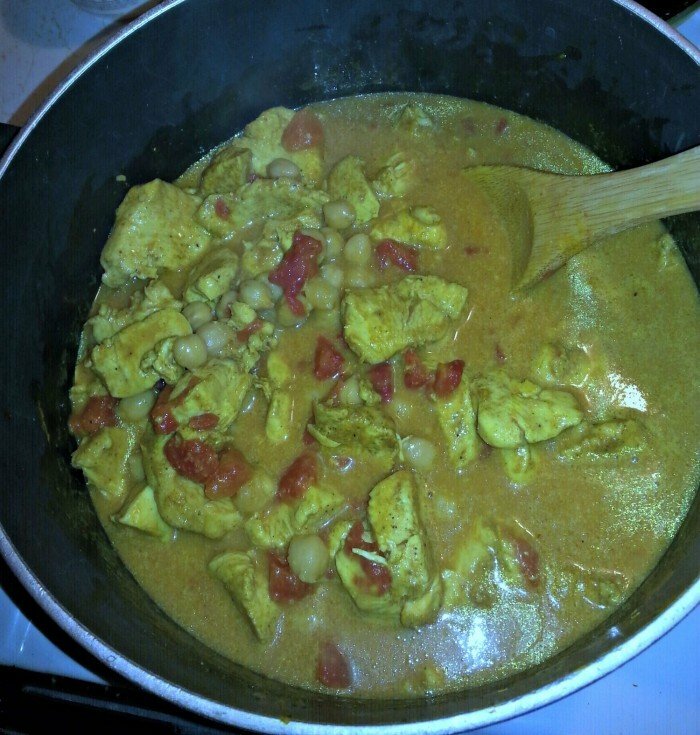 Since we like garbanzo beans a lot, we almost always add them and diced tomatoes to our tikka masala recipe. It helps stretch my budget, and it also make is a full meal. I start by cutting my chicken into 1-2″ chunks. We use chicken breasts, but chicken thighs work great in this if you prefer dark meat. Before I add to my large stockpot to cook, I like to preseason them. In the recipe below, you’ll see I recommend mixing all seasonings together and dividing them. This is why. I like the flavor in the sauce, but also the individual pieces of chicken to be well seasoned. I cook my chicken on medium heat in coconut oil. Some prefer to use olive oil, but since I add coconut milk to this recipe anyway, the coconut oil seems to work well for me. I use a large stockpot for this recipe because it helps when I add liquids. I prefer having plenty of space to easily stir things around. As you can see, it does create a nice sauce so you need that space. 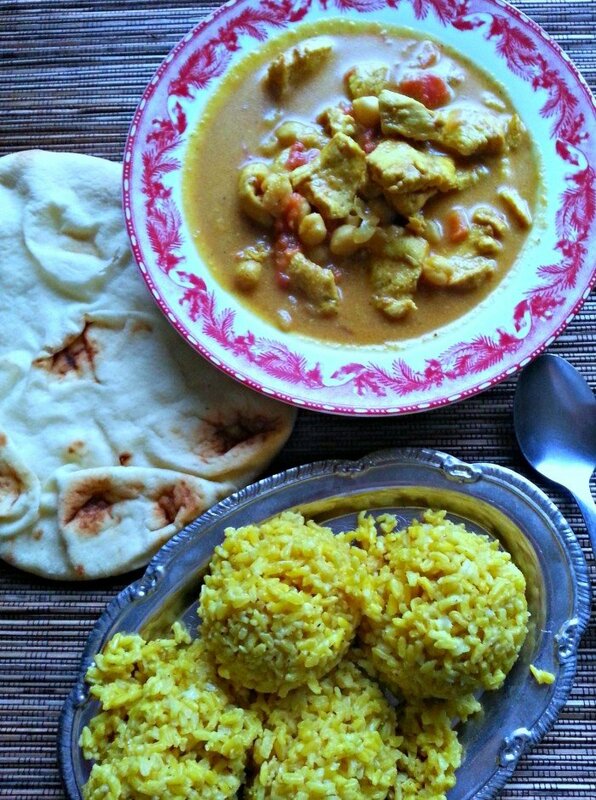 You can buy saffron rice packages to cook, make your favorite brown or white rice, or use the easy saffron rice recipe I shared a few years ago. It’s our standard go-to rice for any Indian dishes I make. I do highly recommend investing in a rice cooker if you plan to cook rice often. I love ours and it takes so much of the work out of dinner prep. We always include some Naan. I’ve made homemade on multiple occasions, but the store bought variety is equally delicious. In a small bowl, mix together all dry spices. Divide and set half aside. Sprinkle half of dry spices onto chicken pieces until well coated. Heat coconut oil in large stockpot, add chicken and cook for 5-6 minutes stirring occasionally. Add in remaining dry spices, garbanzo beans, roma tomatoes, tomato paste, chicken stock and coconut milk. Reduce heat to low and stir in yogurt. Make sure to stir while pouring this in and mix well. Reducing heat prevents the yogurt from curdling in the heat. Simmer for additional 15 minutes. 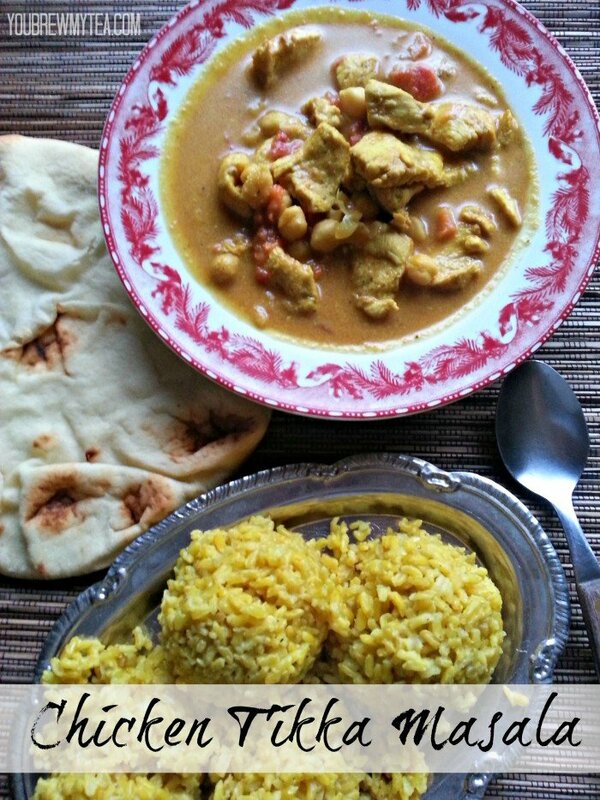 We make this easy chicken tikka masala recipe mild since the Wee Child doesn’t like super hot items. If you prefer a bit spicier meal, you can easily amp up the heat a bit. This recipe is by far one of our family favorites. 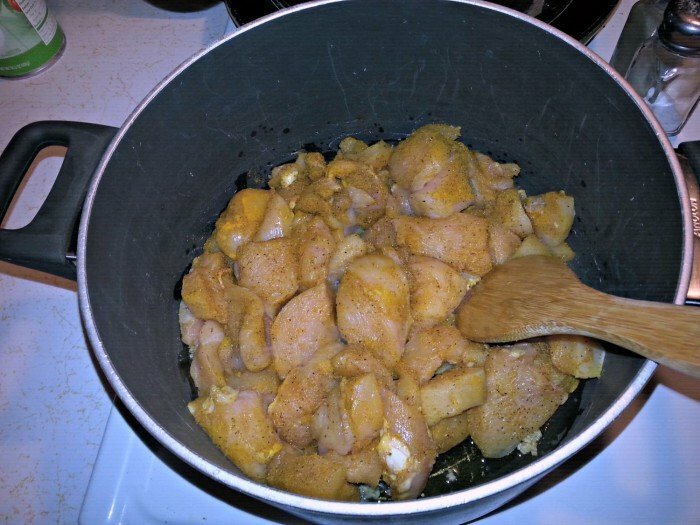 If you like to create easy freezer meals, this can be easily prepped with all ingredients cooked so all you have to do is dump into your Crockpot to reheat, or it can be dumped into a freezer bag raw for easy dump chicken meal. Either way you’ll love it! Oh YUM! This looks incredible. And THAT RICE! What kind of rice is that? Did you mix it with anything? It looks to die for! This looks delicious and easy and full of flavor!! So glad I found this post on the Wednesday Link Party! On my menu list!